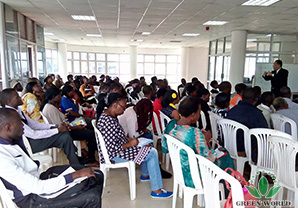 The fruitful Green World African Region intensive training has extended to Eastern Africa to the beautiful country of Uganda. Green World Uganda distributors cheerily welcomed Mr. Budiman Prasetyo, Green World African Region Training Manager, as they were ready to tune themselves to higher standard of education in order to give excellent service to society in promoting health and getting a higher quality of life. 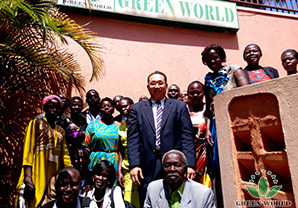 Wednesday, March 25th, 2015, Mr. Budiman together with Mr. Jeff Li, General Manager of Green World Uganda Branch, visited Tororo, the agriculture city in eastern region of Uganda. Tororo meeting was organized and managed by Green World excellent *8 distributor, Madam Rose. 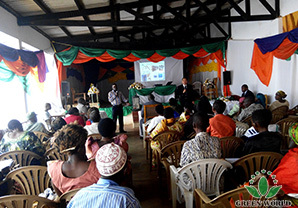 In Tororo, Mr. Budiman held the ¡®Green World, A Life Changing Opportunity Seminar¡¯. Mr. Budiman presented Green World updated company profile, then created health awareness among the audiences and introduced Green World health product series as the solution to current health challenges. In the final term, Mr. Budiman explained clearly the great business opportunity offered by Green World for Tororo people. The audience was very excited at having the life-changing opportunity of Green World in promoting greater health and possibility to have a better quality of life. 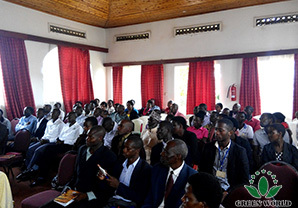 Friday, March 27th, 2015, a newly set meeting was held in Mount Zion Hotel in Kampala, capital city of Uganda. Mr. Dimo, Green World *8 distributor arranged the Opportunity Seminar as he invited many new prospects coming to witness the great business opportunity of Green World. Mr. Budiman introduced Green World updated Company Profile. Among the audience Mr. Budiman has awaken the people¡¯s health awareness as we can hardly avoid some challenges that may affect our health. Mr. Budiman clearly introduced Green World health products series as the solution to modern health challenges. Mr. Budiman explained clearly the business plan of Green World, as the opportunity may provide extra income to distributors. Besides, distributors can receive many awards such as free International trip, business car, luxury car and house fund awards. The audience was very excited for the opportunity given by Green World. 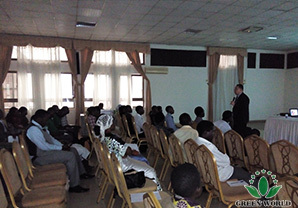 March 30th ¨C 31st, 2015, Green World Uganda Branch held a Top Leaders Training in Jakiba Continental Hotel in Kampala. The two days training was especially designed to equip Uganda leaders with network business skills and advanced product knowledge. March 30th, 2015, Mr. Budiman delivered Green World Gold Camp Training, explained on team building, smart way of work based on Green World marketing plan, how to set goals for effective activities of the team, how to strengthen team relationship, how to develop long distance lines in order to build bigger and stronger network. March 31st, 2015, Mr. Budiman continued the leaders training at Jakiba Continental Hotel by delivering Green World advanced product training. Mr. Budiman explained every single product profoundly and his presentation has built confident to all leaders of Uganda to expand the Green World market share in Uganda. 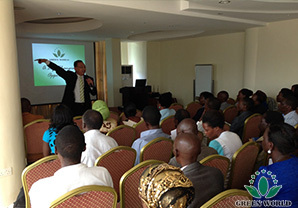 April 1st, 2015, Mr. Budiman held Green World Basic Product Training at Green World Kampala Branch Office. The training was provided for Green World *3 above, as Mr. Budiman explaining on how to create health awareness among prospects. Mr. Budiman briefly explained on health challenges and the solution of Green World health product series. He also presented the knowledge of strengthening human digestive system, circulatory system, bone and joint, respiratory system, immune system, as well as how to enhance woman and man fertility and sexual healthcare. Green World distributors were very excited as they got more dimensions of knowledge on human health challenges and the solution provided by Green World through the excellent health product series. 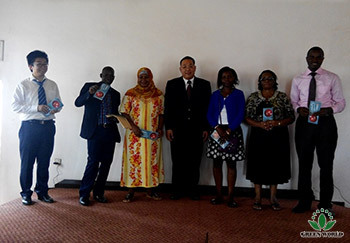 April 2nd, 2015, another basic training series was delivered by Mr. Budiman at Kampala office. 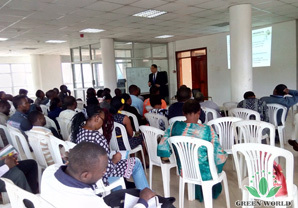 He delivered Green World Star Camp training as the basic network business training needed by newly joined and junior level distributors to start up the business professionally. Green World Star Camp Training consists of how to start the business, how to set your goals, how to generate new leads, how to invite people and how to do business presentation. 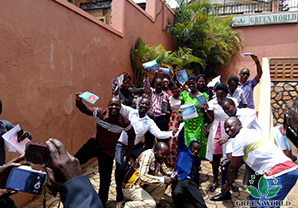 The basic network marketing business skills have equipped all basic level Green World distributors to build more new networks and expand the business throughout Uganda. The excitement of 2 days basic training ended with a group picture taken together with Mr. Budiman and Mr. Jeff Li, General Manager of Uganda Branch. 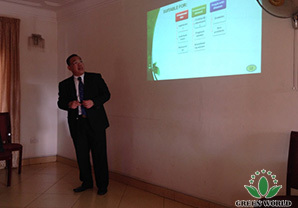 April 3rd, 2015, Mr. Jeff Li, General Manager of Green World Uganda branch held a meeting with Uganda International Trip awardees in Kampala office. Mr. Jeff Li explained the itinerary in China and Mr. Jeff Li gave important message for all China trip participants on how to take care of themselves during the trip. Mr. Budiman also provided some useful tips to all awardees concerning their trip to China. April 7th, 2015, Green World Uganda office team took a journey to western region of Uganda. On the same day, Mr. Budiman, Green World African Training Manager together with Mr. Jeff Li, General Manager of Uganda branch arrived in Masaka city. In Masaka, Mr. Budiman and Mr. Jeff Li received a warm welcome by the Mayor of Masaka city whom also joined the Green World seminars. In the seminar session, Mr. Budiman delivered Green World ¡®A Life Changing Opportunity¡¯ presentation. Mr. Budiman introduced Green World company profile to honorable guests and the audience, thereafter he explained on current health challenges and introduced Green World health product series as the solution to the health challenges. 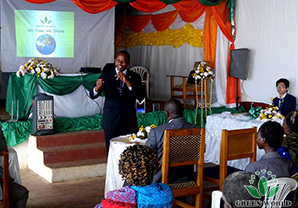 Mr. Budiman also explained how Green World provides a business opportunity to Masaka people as they can enjoy the benefits of products and compensation plan by running Green World network marketing business. The presentation received a very positive respond from the Mayor of Masaka city, other honorable guests and the audience. The Mayor of Masaka city expressed his sincere wish that Green World could help to bring more opportunities in providing business employment that may benefit Masaka people and society. After the fruitful presentation by Mr. Budiman, the Mayor of Masaka city delivered an honorable speech, as the Mayor briefly appraised the commitment of Green World in helping Masaka people promote their health and improve life quality in Green World. 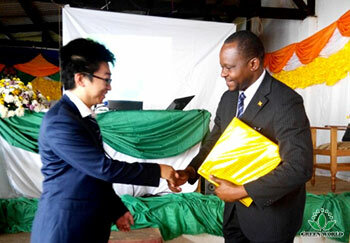 Mr. Jeff Li, General Manager of Green World Uganda branch presented a gift for the Mayor of Masaka city and other honorable guests. 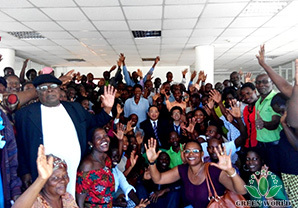 At the end of the session, Mayor of Masaka city took a group picture together with the China Trip 2015 awardees from Masaka city. The joyfulness of Green World has brought promise for a brighter future of Masaka people. 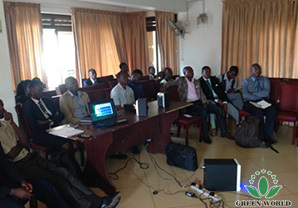 April 8th, 2015, Green World Uganda Branch team moved to Mbarara city in western region of Uganda. In Mbarara, Green World has arranged a two days presentation and seminar in order to accomplish higher results in western region of Uganda. On the first day, Mr. Budiman delivered Green World ¡°A Life Changing Opportunity¡¯ seminar to new prospects. Mr. Budiman introduced Green World updated company profile, introduced excellent Green World health product series and presented the life changing opportunity of Green World network marketing business. During the session, China Trip 2015 awardees from Mbarara city were invited onto the stage to receive the confirmed return ticket to China. 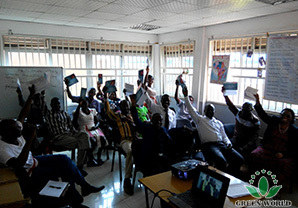 April 9th, 2015, the second day of training in Mbarara city, Mr. Budiman delivered Green World Star Camp Training. 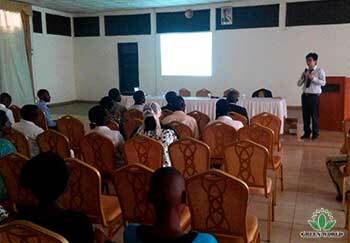 He guided Mbarara distributors on how to start doing a successful business with Green World. 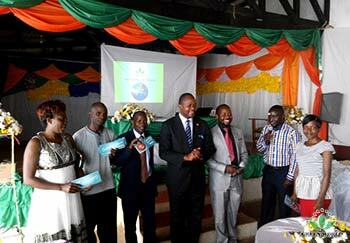 Mr. Budiman encouraged and motivated Mbarara distributors to work harder and achieve higher rewards from Green World. 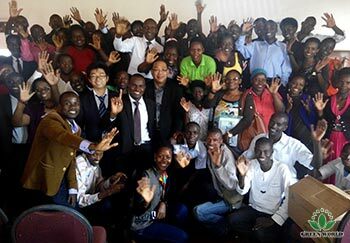 At the end of the session, Mr. Budiman and Mr. Jeff Li took a group picture together with excellent Mbarara Green World distributors. 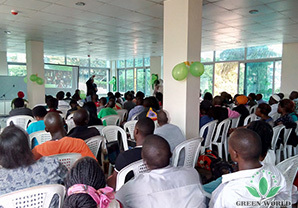 April 10th, 2015, Green World Uganda branch office witnessed a Mega Presentation of Green World ¡®A Life Changing Opportunity¡¯ at Soliz House, Green World Kampala Office. 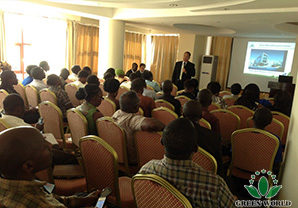 The event was designed to give an opportunity to Green World distributors to invite more new prospects. During the event Mr. Budiman played Green World videos of Company Profile, International Trip and Car Award Ceremony in various countries. As the host, Mr. Edison, excellent *7 distributor gave a warm welcome to all new prospects to the event. 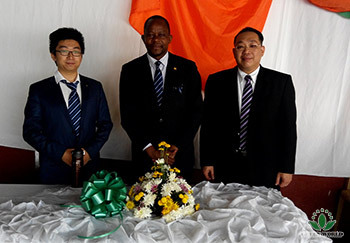 Mr. Edison introduced Mr. Jeff Li as the General Manager of Green World Uganda branch and Mr. Budiman as the Training Manager of Green World African Region. The event continued with Mr. Budiman¡¯s introduction of Green World company profile, and was followed by presenting the health challenges and the solution of those challenges with Green World health product series. Mr. Budiman processed by presenting the life changing opportunity by joining Green World network marketing business. He briefed on the benefits of becoming Green World distributor. Everyone would have the same opportunity to gain high level of income, free international trip, business car award, luxury car award and house fund award. The audience was very excited after receiving the clear explanation on how simple to do Green World network marketing business. After the session, many prospects directly signed up and joined Green World business as they¡¯re confident on how Green World can really give a much better quality of life. 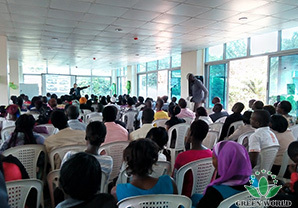 April 12th, 2015, Green World Uganda branch team visited Mukono city, the neighbor city of Kampala. 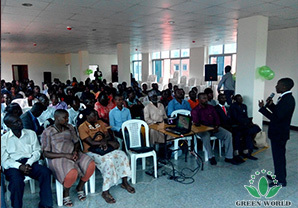 Green World Uganda hosted a Green World opportunity seminar in Mukono city. 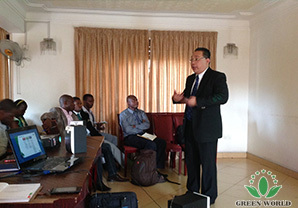 The meeting began with a motivational speech by Mr. Jeff Li, General Manager of Green World Uganda to the audience. Mr. Budiman delivered the Green World ¡®A Life Changing Seminar. He introduced Green World company profile and the value of Green World health product series. Then Mr. Budiman explained the opportunity given by Green World to get high level of income and many rewards by joining Green World network marketing business. 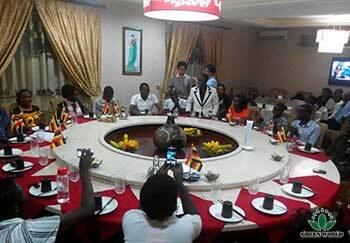 The excitement of Green World intensive trainings in Uganda was pushed to a higher gear on April 14th, 2015, as 23 excellent Green World China Trip awardees were invited to have gala dinner together with staff and management of Green World Uganda branch office at Arirang Restaurant, Kampala. 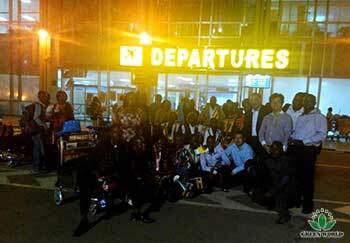 The China Trip 2015 awardees were very happy as they were about to start the wonderful journey to China, to visit Green World Tianjin Head Quarters and production base, and to enjoy the unforgettable holiday in China, as they will bring back the confidence to grow Green World business to the highest level back to Uganda.